Download "One Year Malpractice Statute of Limitations Held Applicable to a Druggist Filling a Prescription"
3 RECENT DEVELOPMENTS anyone guilty of that offense. Thus, the decision is not authority for holding that negligence while engaged in the practice of pharmacy is to be classified as malpractice. 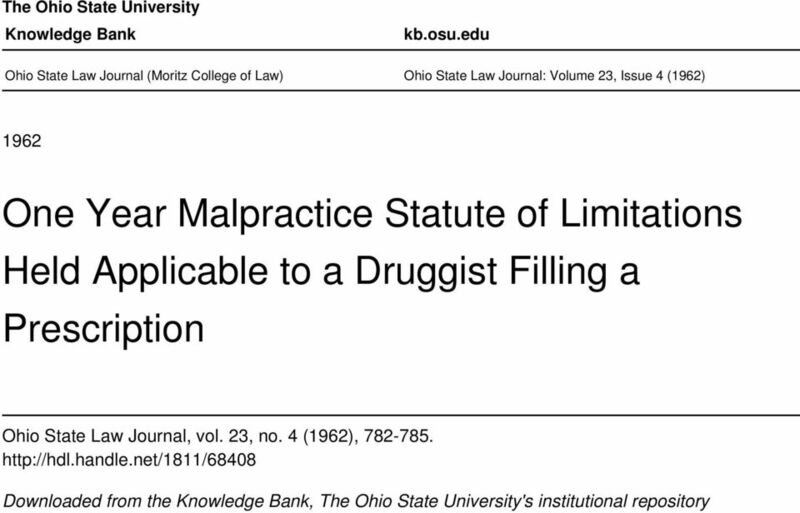 There being no specific authority in point, the question resolves itself into determining what is meant by the word malpractice in the Ohio statute and whether the expansion of the definition to include a pharmacist's negligence is justified. There are two reasons why it is believed that the Ohio statute should not apply to pharmacists. The first is that announced in a case decided by the New York Supreme Court which held that a nurse's negligence was not malpractice. 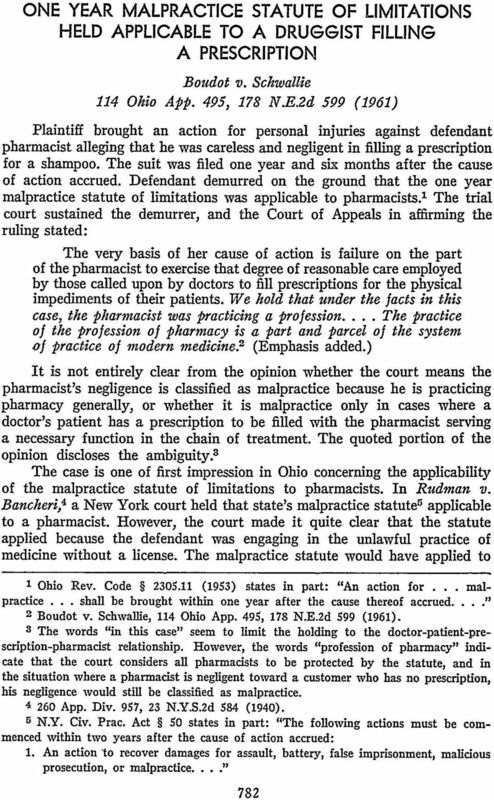 In Isenstein v. Malcomson, the court stated: Malpractice is to be understood in its primary meaning, and, as generally understood by the ordinarily intelligent and reasonably informed person, and, in this respect, according to such common usage and acceptance, it has continuously been intended to import an improper treatment or culpable neglect of a patient by a physician or surgeon. 6 The second and more important reason is that in cases where Ohio courts have construed the statute as applicable to others in the field of medicine, the relationship has always been one where the injured person was a patienb of the tortfeasor. 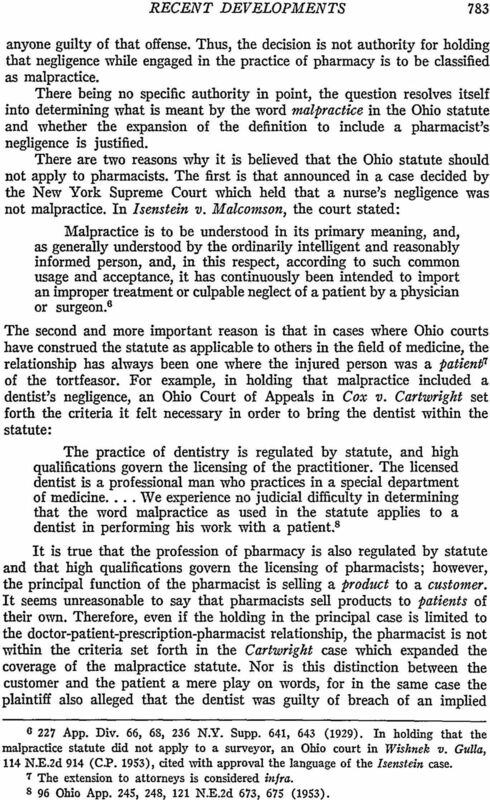 For example, in holding that malpractice included a dentist's negligence, an Ohio Court of Appeals in Cox v. Cartwright set forth the criteria it felt necessary in order to bring the dentist within the statute: The practice of dentistry is regulated by statute, and high qualifications govern the licensing of the practitioner. The licensed dentist is a professional man who practices in a special department of medicine... We experience no judicial difficulty in determining that the word malpractice as used in the statute applies to a dentist in performing his work with a patient. 8 It is true that the profession of pharmacy is also regulated by statute and that high qualifications govern the licensing of pharmacists; however, the principal function of the pharmacist is selling a product to a customer. It seems unreasonable to say that pharmacists sell products to patients of their own. Therefore, even if the holding in the principal case is limited to the doctor-patient-prescription-pharmacist relationship, the pharmacist is not within the criteria set forth in the Cartwright case which expanded the coverage of the malpractice statute. Nor is this distinction between the customer and the patient a mere play on words, for in the same case the plaintiff also alleged that the dentist was guilty of breach of an implied App. Div. 66, 68, 236 N.Y. Supp. 641, 643 (1929). In holding that the malpractice statute did not apply to a surveyor, an Ohio court in Wishnek v. Gulla, 114 N.E.2d 914 (C.P. 1953), cited with approval the language of the Isenstein case. 7 The extension to attorneys is considered infra Ohio App. 245, 248, 121 N.E.2d 673, 675 (1953). 4 OHIO STATE LAW JOURNAL [Vol. 23 warranty and the court held that no warranty existed. In so holding, the court observed: "Indeed, it may be fairly stated that only a strained view of the professional relationship between the dentist and his patient could class the dentist in the category of a salesman of false teeth. ' 9 However, the professional relationship between a pharmacist and a buyer of drugs has all of the business characteristics of the salesman-customer transaction. In the case of Davis v. Eubanks, 10 an Ohio common pleas court extended the malpractice statute to the negligence of a nurse in administering an injection of penicillin to the plaintiff. The court relied on the definition of the term malpractice in Bouvier's Law Dictionary: Bad or unskilled practice in a physician or other professional person, whereby the health of a patient is injured, is usually called malpractice." Once again the plaintiff was a patient and the court found that the nurse qualified under the term other professional person contained in the definition. Although, the pharmacist also would qualify as a professional person, his activities fall short of classifying him as treating patients of his own, and he would therefore fail to qualify under the definition adopted by this court. Emphasis has thus been placed on the definition of malpractice, the consideration of public expectation and community understanding of the word, and the difference in services provided by pharmacists and those of physicians and other professional medical persons. However, if the intention of the legislature can be ascertained, the courts are bound to follow that intention whether based on explicit words in the statute or gained from the history surrounding the act. For this reason, Long v. Bowersox 12 is perhaps the most important case showing that malpractice has been extended beyond what the legislature had in mind. In the Bowersox case, malpractice was held to include the negligence of attorneys in dealings with their clients. The plaintiff insisted that malpractice applied only to physicians and surgeons. 13 The court emphasized different dictionary definitions and then stated: Green and Kelley's Ohio Pleading and Practice, 61; Bates' Pleading (1st Ed. ), 288; and 2 Bates' Pleading (2 Ed. 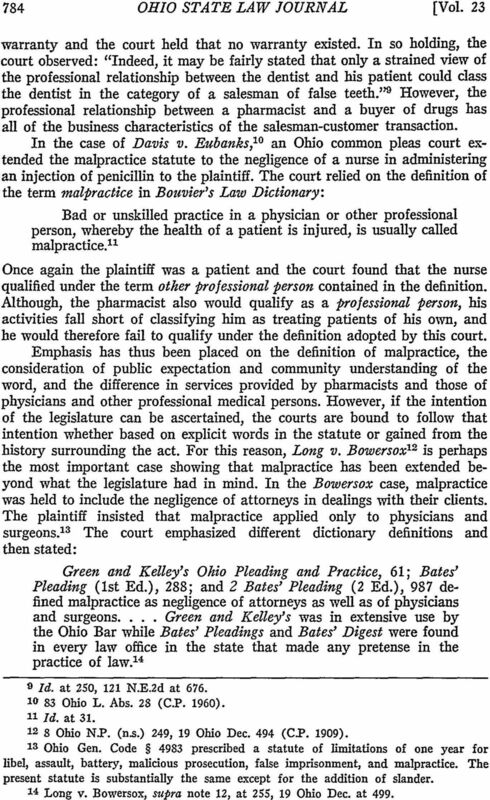 ), 987 defined malpractice as negligence of attorneys as well as of physicians and surgeons.... Green and Kelley's was in extensive use by the Ohio Bar while Bates' Pleadings and Bates' Digest were found in every law office in the state that made any pretense in the practice of law Id. at 250, 121 N.E.2d at Ohio L. Abs. 28 (C.P. 1960). 11 Id. at Ohio N.P. (ns.) 249, 19 Ohio Dec. 494 (C.P. 1909). Is Ohio Gen. Code 4983 prescribed a statute of limitations of one year for libel, assault, battery, malicious prosecution, false imprisonment, and malpractice. The present statute is substantially the same except for the addition of slander. 14 Long v. Bowersox, supra note 12, at 255, 19 Ohio Dec. at 499. 5 1962] RECENT DEVELOPMENTS 785 This decision, then, helps to show what was in the minds of the legislators when they adopted the amendment and added the word malpractice in With respect to the medical aspect of malpractice, the decision reinforces the contention that malpractice included only the negligence of physicians and sugeons and that this is the common understanding of the word. 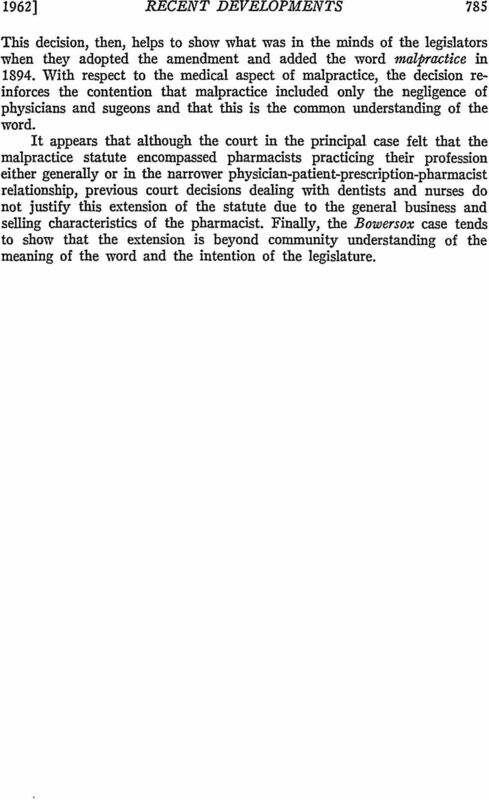 It appears that although the court in the principal case felt that the malpractice statute encompassed pharmacists practicing their profession either generally or in the narrower physician-patient-prescription-pharmacist relationship, previous court decisions dealing with dentists and nurses do not justify this extension of the statute due to the general business and selling characteristics of the pharmacist. Finally, the Bowersox case tends to show that the extension is beyond community understanding of the meaning of the word and the intention of the legislature. Page 1 of 7 809.66 MEDICAL NEGLIGENCE - HEALTH CARE PROVIDER'S LIABILITY FOR ACTS OF NON-EMPLOYEE AGENTS - RESPONDEAT SUPERIOR - APPARENT AGENCY. 1 NOTE WELL: This instruction previously was labeled N.C.P.I. Can Defendants in a Medical Malpractice Claim With Separate and Distinct Duties Owed to Plaintiff be Joint Tortfeasors? 295 Ga. 329 FINAL COPY S13G1733. GALLANT et al. v. MacDOWELL. BENHAM, Justice. This is a case of alleged dental malpractice. The trial court granted summary judgment to appellants Steven M. Gallant, D.D.S. APPEAL from an order of the circuit court for Milwaukee County: THOMAS P. DONEGAN, Judge. Affirmed. COMMERCE INSURANCE CO., INC. vs. VITTORIO GENTILE & others. 1. September 16, 2015. STATE OF MINNESOTA IN COURT OF APPEALS A13-1072. Yvette Ford, Appellant, vs. Minneapolis Public Schools, Respondent. MISSOURI COURT OF APPEALS NORTHERN DISTRICT. David Moore, for Appellant, and Stone C. Defense for Respondent. 2015 IL App (1st) 141985-U No. 1-14-1985 NOTICE: This order was filed under Supreme Court Rule 23 and may not be cited as precedent by any party except in the limited circumstances allowed under Rule 23(e)(1). NURSING HOME CARE ACT INTRODUCTION The Nursing Home Care Act, 210 ILCS 45/1, et seq., was adopted amid concern over reports of inadequate, improper and degrading treatment of patients in nursing homes. Darryl S. Weiman, M.D., J.D. IN THE COMMON PLEAS COURT OF FAIRFIELD COUNTY, OHIO MARY LEMASTER, : Plaintiff, : Case No. 12 CV 422 v. : Judge Berens BERGER HEALTH SYSTEM ET AL., : ENTRY Granting Defendant s Motion to Dismiss Defendants. STATE OF MINNESOTA IN SUPREME COURT A13-1302. Court of Appeals Anderson, J.